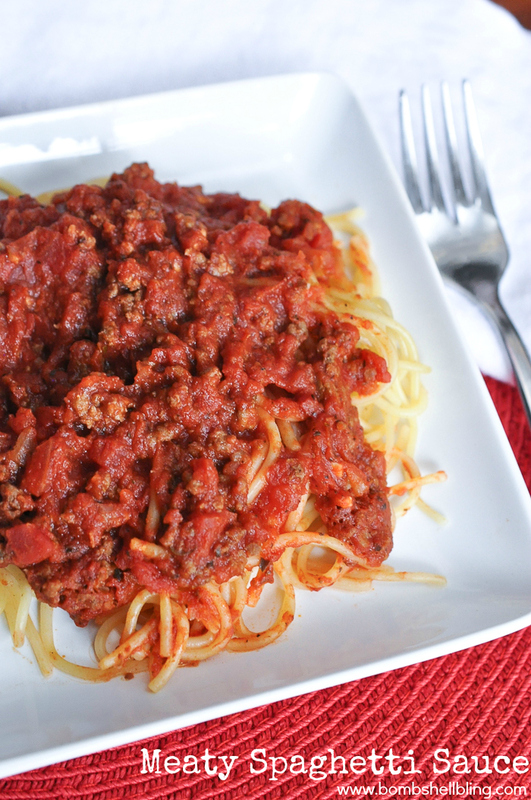 It has been awhile since I shared a recipe with you, so I thought today could be a good day to share my in-law’s meaty spaghetti sauce recipe. It is SUPER simple to put together, but hearty and delicious. My mother-in-law got this recipe years ago from an Italian family that lived next door to them. The Italian family used sausage in the recipe traditionally, but I’m not a big sausage person, so I just use ground beef when I make this spaghetti sauce. I always double this recipe because it freezes beautifully as well! Another great thing about this recipe is that you can add pureed vegetables to it as a sneaky mama move if you so desire. It will change the flavor and consistency a bit, but it’ll still be tasty! Spaghetti is one of the ultimate comfort foods in my book. A hearty plate of spaghetti, especially with some warm breadsticks or garlic bread, is sure to warm you up on a chilly night or comfort you when you’re blue, dontcha thing? Now let’s get cooking! Throw in olive oil and onion (with meat) and cook until onion is soft. Add garlic and cook for 15 seconds (ONLY IF USING FRESH GARLIC, otherwise add garlic later with other spices). Taste a couple of times to ensure that you have the spices the way that you like them.